Published: June 5, 2013 at 05:23 p.m. Updated: June 5, 2013 at 08:17 p.m.
Washington Redskins running back Alfred Morris is a nicer guy than you. He's not a "nice guy for a professional athlete" or an athlete who brings cameras along so that everyone knows he's cool. He's just a guy who's nicer than you. Or nicer than me, anyhow. 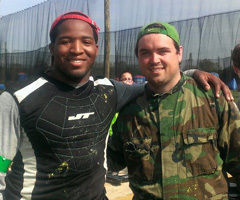 The latest evidence: Morris' adventure playing paintball. According to the Reddit poster "CaptainCrookedFoot," via the Washington Post, Morris ran into a group of fans while playing paintball. Instead of just chatting with them for a little while, he joined their game -- for three hours. And then he hung out some more. "We went to Pevs for one of my buddies bachelor party and saw Alfred," the fan wrote on Reddit. "He played with us for 3 hours and even met up with some of the other guys later to go kart." We almost wouldn't believe the story if not for the pictures.